Does aldermanic prerogative undermine Chicago’s Pedestrian Street ordinance? Ed. note: This post was written by Steven Vance and Christopher Gagnon, a Logan Square resident. Good question. This message, posted December 6 to the Logan Square Yahoo! 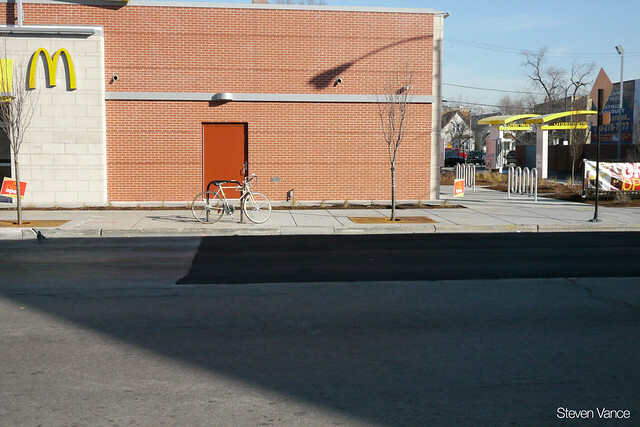 Group, a neighborhood online discussion board, can be read as more than a criticism of the architecture of the newly rebuilt McDonald’s at 2707 N Milwaukee Avenue, as it recalls a controversial decision – and some unfinished business – for Logan Square pedestrians. Chicago’s City Council established the “Pedestrian Streets” (“P-Streets”) ordinance to “preserve and enhance the character of…pedestrian oriented shopping districts…[and] to promote transit, economic vitality and pedestrian safety and comfort,” and this designation was applied, among other locations citywide, to Milwaukee Avenue between Kedzie and Sawyer. When the owners of the McDonald’s located within this area decided to build a new store at their existing location, they turned to Alderman Colón for relief from restrictions imposed by the P-Street designation that would have prohibited their drive-thru operation. In November 2011, Alderman Colón introduced a controversial ordinance (adopted June 2012) removing the area from the list of P-Streets so McDonald’s owners could obtain the necessary permits for the curb cuts and drive-thru. Continue reading Does aldermanic prerogative undermine Chicago’s Pedestrian Street ordinance? Posted on January 11, 2013 March 30, 2019 Author Steven VanceCategories Businesses, Chicago, Design, Neighborhoods, Planning & Policy, WalkingTags Alderman Colón, EveryBlock, Logan Square, McDonald's, Pedestrian Street, zoning code28 Comments on Does aldermanic prerogative undermine Chicago’s Pedestrian Street ordinance? It’s rare to see CTA and Metra signs in the same place. The LaSalle Intermodal Transfer Center at LaSalle Street and Congress Parkway is a great step in making transit work “regionally”: it connects Rock Island District trains and multiple bus routes. It provides weak signage directing riders to the Jackson Blue Line station one block away. Photo by Anne Alt. “The Regional Transportation Authority values input of how to better the regional transit system. The RTA is conducting a survey to help gather ideas to inform the strategic planning process.” This quote is from its website promoting the process. In August we published an article from two guest contributors about Metra and its own strategic plan update process. One critique was that Metra was doing this independently of the other “service boards” (Chicago Transit Authority and Pace) and its parent organization, RTA. You can provide your input on their strategic planning process with an online survey through January 25, 2013. I reached out to RTA to understand why, again, there is an organization doing this planning process alone. In a nutshell, there are separate (coordinated, not independent) strategic planning processes that are undertaken by the individual agencies because transit aims to strike a balance between addressing long-term, regional concerns and more near-term, local needs. The scope of Service Board strategic planning initiatives usually encompasses operating and service provision issues—issues for which the service boards are experts. For example, this might include developing or revising service planning standards—at what level of demand should we increase service or build an infill station? Does the agency have enough reliable vehicles in its fleet to provide the desired levels of service envisioned for the next 2-3 years? These are the nature of issues for which the service boards have the most experience and local knowledge by which to develop plans and policies. How far does your expressway avoidance take you? Showing undesirable pedestrian and sidewalk conditions under the Kennedy Expressway on Belmont Avenue at Kedzie Avenue. There is a bus stop here, on a portion of the sidewalk that narrows to about 2 feet. It wasn’t until I wrote this post that I realized that there is no bus route on Kedzie Avenue making this bus stop’s location quite ridiculous. There are bus stops in both directions on Belmont Avenue that are actually near businesses and residences. Explore on Google Street View. I shop for groceries mostly at Aldi. The one nearest my house is 3,725 feet by walking (about 0.71 miles), the Avondale Aldi. The next closest store is 11,102 feet away (about 2.1 miles), the Lincoln Square Aldi, and the third closest is 11,599 feet away (about 2.2 miles), the Wicker Park Aldi. I live at Belmont and California, in Avondale. I shop at the third closest one the most often. The Wicker Park Aldi is at Milwaukee Avenue and Leavitt Street. The reasons I shop here instead of the other two, considering that it’s two-thirds closer to home, are based on two travel factors: trip chaining (the practice of attaching multiple trips into the same one so one leaves the house less often), and trip quality (the characteristics that make the trip interesting, not interesting, safe, and unsafe). A trip, as counted by transportation planners like myself, is movement from one address to another. For example, the Chicago Transit Authority counts trips taken on its buses and trains as “boardings”, each time a passenger pays for the bus or passes an ‘L’ station turnstile. When people change routes on the same platform or station, this additional trip isn’t counted because there’s no mechanism to do so. A person who takes a bus to an ‘L’ station is counted twice in CTA’s reports (note 1). Continue reading How far does your expressway avoidance take you? Posted on January 7, 2013 January 7, 2013 Author Steven VanceCategories Bicycling, Businesses, Chicago, Infrastructure, Neighborhoods, Planning & Policy, Roads, WalkingTags AASHTO, Aldi, Avondale, bike parking, Chicago Pedestrian Plan, National Household Travel Survey, shop by bike, shopping, strategies from the Chicago Pedestrian Plan, trip chaining, Wicker Park36 Comments on How far does your expressway avoidance take you? Transit users whose employers provide pre-tax benefit programs stand to pay less taxes in 2012 and 2013. Photo by Erin Nekervis. January 1st always comes with new laws. This January 1st was a little different than most in that the United States was closing in on the “fiscal cliff”. The American Taxpayer Relief Act of 2012 is expected to be signed into law by President Obama and includes provisions that raise taxes on a majority of Americans, and prolongs extended unemployment benefits, among other changes to the tax code. A major change, fought over for years by sustainable transportation advocates, is the coming yearlong parity of the transit commuter benefit with the parking benefit. These two programs deduct the cost of a monthly transit or parking pass before calculating taxes owed (“pre-tax benefit”). For 2013, there is no longer a financial bias in the federal tax code against public transit use. This has always been an issue of fairness, and public transit advocates are pleased that the federal tax code will again provide transit riders with the same tax benefits according to those who drive to work. The change will be retroactive to January 1, 2012, so workers whose employers implement this program will be able to receive tax benefits for any passes they purchased through the program last year. Unfortunately, the benefit expires December 31, 2013. This isn’t the first time that the transit commuter benefit will expire while the parking benefit remains. The American Recovery and Reinvestment Act (ARRA 2009, also known as the “stimulus”) raised the transit commuter benefit from $120 to $230 per month, but that expired on December 31, 2011. The parking benefit remained at $230 per month. The road ahead. 2012 was also the most active year for new bike lanes in Chicago, including this one on Lake Street at Rockwell. We expect many more miles in 2013 as well as the advancement and launch of other new transportation projects. Photo by Gabriel Michael. Grid Chicago launched in June 2011, so 2012 represents our first calendar year of blogging. What did we write? A lot. We, including our many contributors, wrote 353,487 words in 466 posts (an average of 38.3 per month). For comparison, Ayn Rand’s The Fountainhead has 311,596 words. The table below lists the most popular posts (measured purely by page views in that month only) and the number of comments they received. We also traveled a lot. The both of us, at different times, visited Denmark, Germany, and the Netherlands. Between us we visited many states, including Pennsylvania, Wisconsin, Iowa, Indiana, Utah, Colorado, Virginia, Oregon, and New York (we didn’t write about every visit, though).